World's most powerful planned non-nuclear explosion (known as Big Bang aka British Bang) was carried out by the British Royal Navy on April 18, 1947 to destroy Heligoland, a small Island ( total area 1 square km) in the North Sea. Heligoland Island was earlier under the control of British, who in 1890 exchanged it with Germany for a part of land in Zanzibar. At that time the British didn't realise the strategic importance of this Island. The Germans used it as U-2 base during the First World War. Later Hitler fortified it and made it into a submarine base to control and attack the shipping in the North Sea during the Second World War. During the WW-II, the British regularly bombed it because of its strategic importance. 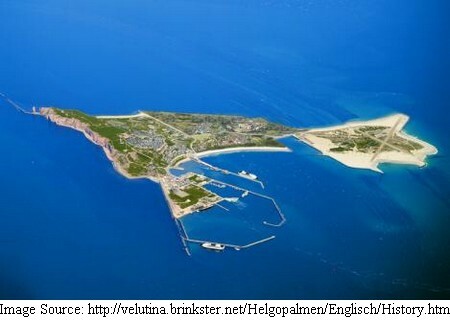 As a matter of fact the first RAF bombing of the German soil took place at Heligoland on December 3, 1939. Thereafter several bombings were made and the last and heaviest bombing took place on April 18-19, 1945 when almost 1000 (969) allied aircrafts used the famous Tallboy - an earth quake bomb which weighed five tons and was effective against hardened structures against which earlier, smaller bombs had proved ineffective - to bomb the Naval base, airfield and the town into crater-pitted moonscapes, resulting in almost total destruction of all the structures on the Island. After the War for about two years the RAF used the Island as target practice area. In 1947 British powers-that-be decided to completely destroy the Island and alongwith it the German fortifications, underground bunkers and submarine base. Accordingly about 6,800 tonnes of explosives (approximately 1/3rd the size of Hiroshima atomic bomb) consisting of about 4000 torpedo heads, 9000 depth charges and over 91,000 shells were stacked in the underground tunnels and bunkers and were detonated precisely at 13:00 hours on April 18, 1947. The enormous explosion resulted in a volcanic-type eruption of fire, soil and rock which shot into the sky creating a mushroom cloud over 6,000 metres high. The blow shook the main island several miles down to its base, and permanently changed its shape - its southern tip caved in to a huge crater. The sound of explosion was heard as far as Sicily, about 2000 kilometres away. As per Guiness Book of World Records this was World's most powerful planned non-nuclear explosion. Beacuse of copyright reasons I am not able to show here the images of these events but I am giving links to some of the images which will give an idea of the happenings during this period. In-spite of massive explosion, the Island survived. Although most of the buildings were flattened surprisingly the Flak (anti-aircraft) Tower remained standing [Photo Link]. It has since been renovated and now functions as a lighthouse (Shown below). The British continued to use it as bomb practice area. It was finally handed back to the Germans in 1952. It has since been restored and is a big tourist attraction. Its clean air is reportedly very beneficial for hay-fever sufferers.